You sit in front of the Sphinx on padded chairs with the three pyramids in the background. Then the music starts and the narrator tells the story of Egypt from as the Sphinx saw it from the dawn of civilization to modern time. It's a great spectacle with lasers, spots, and cinematic scores reminiscent of the 1950's Hollywood movies like Cleopatra. 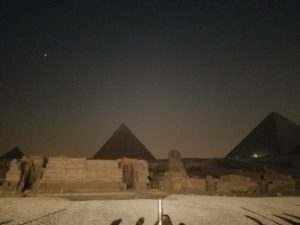 Before the show started I caught this photo of a natural spectacle before the man-made one began....Venus in full view above Giza...that's the bright spot between Khafre and Menkaure's pyramids. What few probably noticed is that the near full moon (towards our backs) was in the constellation Leo. The Sphinx was staring right at itself!